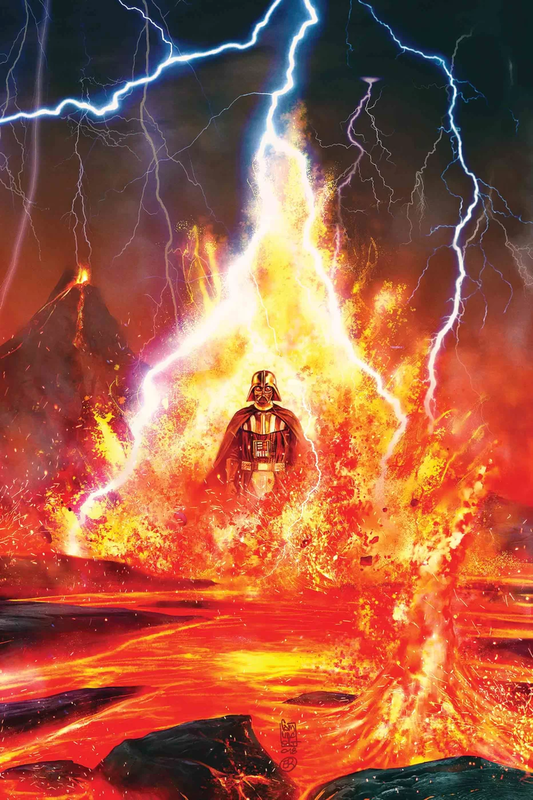 Darth Vader #25 is the finale of Charles Soule’s Vader run. This is the culmination of everything. Vader has built his castle, his doorway to resurrecting the dead. Momin has already shown that it works. The only left is for Vader to go in and bring back Padme. Here’s the thing – there was a lot of promise leading up to this issue, but it wound up ending without much delivery. Soule toyed with the idea of the door beyond worlds, the thing we saw in Star Wars Rebels, but rather than committing to it, he did something different. In fact it doesn’t make a lot of sense what happened in this issue. Further hampering the issue, Soule himself has said in interviews that he was purposely unclear with some things, leaving it up to the reader and time to sort out what really happened. Say what you want, I wasn’t satisfied as a reader. First off – the Momin issue. We saw that the portal works. Momin resurrected his dead self, possessed it, and came back to life with his own body. Vader then tries to bring Padme back to life. However, rather than explaining why that doesn’t work, the comic alludes to things and goes on a trippy Sith dream sequence of Vader’s past, present and future. We see messed up re-imaginings of things that have happened, will happen or are happening. Nothing in all of that is clear. Thus in the end, the reader is left not knowing what happened and why. It’s a messy way to tell a story. More importantly, it dodges the whole Padme issue. Why can’t Vader bring her back? Momin brought himself back. Ezra brought Ahsoka back. Why doesn’t this work for Vader? Why would this make him give up? Rather than the portal being a doorway to possibilities and windows in time, places where Vader could pull people out of and save them, it plays out more like a dream where nothing is possible. Everything is intangible. Secondly – there’s the Palpatine/father deal. People are taking the panel that shows a pregnant Shmi with a creepy Palpatine hovering over her as a sign that Palpatine is Vader’s dad. There’s even a panel showing Palpatine and Obi-Wan with the words “I am your father.” It’s done in a way where people can jump to conclusions and say, “Aha! Palpatine did create the chosen one.” Or people can refute it and say the whole thing is impression and symbolism. Palpatine didn’t create Anakin but did take an interest in him and in trying to corrupt him. If the Darth Plagueis book wasn’t non-canon, it might make this all easier. But since everything go thrown out, we’re all just stumbling around for answers still, and this comic doesn’t help any. So here’s the heart of the issue – what did happen in this comic? We see Vader leave his body to go into this doorway. In this other realm, he changes bodies, he goes through time, he hears things, he sees things, there’s portals, and there are manifestations that he encounters, talks to and even fights. None of this jives with what Dave Filoni did in a “World Between Worlds.” I think that is the biggest problem. This comic could have built on that story continuity but instead it tried to do something new which made even less sense. For me, that’s why it fell short of what I wanted. I read this comic, and I stopped and realized that I had no idea what happened. Palpatine asks Vader if he found what he’s looking for, and Vader cuts him off and says to himself, “Yes.” But I don’t even know what he meant by that. What did he find? That Palpatine is his father? That Anakin Skywalker is dead and there is no way to bring back Padme? That his son Luke Skywalker is out there waiting for him in the future? None of it’s clear, and it’s hard to be happy with such a muddled story. The artwork, which has a surprising number of artists involved, is pretty good. There’s a lot of weird imagery in this comic, and I guess they do a good job of creating a murky, trippy landscape that doesn’t offer any real answers. In that regard, it’s insync with the writing. Overall, I give this one a two and a half out of five metal bikinis. It’s something, I’m just not sure what. I’m not too fond of stories that require reading extensive interviews with the creators in order to make sense of the story they were trying to tell (or not tell).